Preserve your perishable foods and provide spill-free transportation with this Cambro SFC6SCPP190 translucent seal cover. This lid is designed specifically for your 6 and 8 qt. Camwear square food storage containers. Featuring an interior and exterior seal, this lid promises a secure, leak-proof fit. Made of virtually unbreakable polypropylene plastic, these covers are perfect for commercial kitchens. Withstanding -40 degrees F to 160 degrees F, this cover can be used for hot or cold foods. The crystal clear design enables you to quickly identify container's contents and avoid unnecessary opening. A thumb tab is available for easy lid removal and includes a hole for hanging storage when not in use. We purchased containers and these lids for storing dry goods. The square shape fits nicely when multiple are used. They form a good seal, but, I would not suggest that you use these if you are worried about them tipping over with liquid inside. Cambro always makes a reliable product. These fit like they should and stay tight with each use. We have never had an issue with any of these lids. Cambro are great pans for kitchen use. There are very durable and sturdy. These are excellent for prep, storage, line and banquet service. Easy to handle, clean and store when not in use. I highly recommend. These lids are as snug a fit as one could hope for. Even when moving product from our off-site prep kitchen to the main site where we finish & plate, these double-seal lids ensure that not a drip is lost, even on the bumpy drive down our long dirt road. These lids fit securely on my 8 quart size Cambro containers. The lids fit tight but are easily removed by pressing on the middle while lifting one of the corners up. I like the clear tables as they look clean and sleek. These things are perfect! They fit very tightly on my 8qt containers, so they won't let any moisture in. They're built very well, too, so they don't feel like they will fall apart. I have a smaller size of this same lid. They are very sturdy and useful. I use the corresponding containers for storage, dough rising, soaking, etc. I would recommend them. 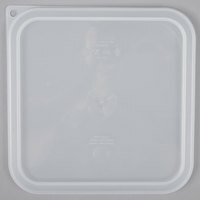 This translucent seal cover will fit Cambro food storage containers that are 6 and 8 quarts in size. The cover fits tightly on the containers to ensure the contents inside remain safe and uncontaminated. These are very inexpensive and really nice quality. They can be washed in the dishwasher. I used this lid recently while brining a turkey breast. Filled almost to the top. Did no leak from normal movements in and out of frig. Went through dishwasher without warping and damage. Great deal for price. These lids allow you to stack the Cambro containers on top of each other for space savings and to keep product inside fresh. You can also see the product from the top without having to open the container. Good clear lid to use on the cambro containers. Works well and when on a lower shelf it allows you to still see whats in the bucket. I love these Cambros. Fit nicely in the fridge, easy to stack, easy to clean. Great for many applications. The lid fits super tight on the matching container. Excellent lids, compatible with both the 6 qt and 8 qt Cambro containers. They snap on very securely, so you'll never need to worry about contents falling out, spilling out, or freshness escaping! These are much better than the colored lids - a much tighter fit, great for ingredient storage. The colored lids are pretty loose - they're good for keeping stuff out of the bin, but not so good at keeping things in. This is a great product from Cambro. I personally recommend paring it with Nobel Product Labels. The center of the lid allows for a nice place to attach the sticker and easily comes clean when time to rotate stock. The lid is also very easy to clean with little to no places for food to hide when cleaning. I paired this lid with the Cambro 8SFSCW135 8 Qt. Clear Square Container. It fits very tight, and seals properly. I am using this in a mobile cafe, so it's especially important for the lid to go on tight so it won't pop off while I'm driving! No complaints! I have a few of these but I prefer the winter rose square lid since they are more rubbery and easier to close. This is more rigid and takes a lot of strength to open or close. I used the colored plastic lids for years and am just now trying these clear and tighter fitting Cambro lids. I like using them for flour and the seal does seem much tighter. Luckily, it isn't all too much more difficult to remove either. These lids where tight fitting but still easy enough to remove and seal. The clear cover makes it easy to identify contents and monitor the remaining quantity. Great lids, fit tightly for pantry or refrigerator storage. They are a little stiff at first, but are easier to take on and off with repeated usage, although they still seal tightly. I bought this to go with the Cambro 8 qt containers and they don't seal properly. One was ok but the rest just do not snap tightly into place. Thank you for the review on these covers! A Customer Solutions Representative will be in contact with you about this. good price and quality. this is very clear, fit good cover. it keep the food dry and safe. also it cleaned very easy. i like it very much. The Cambro SFC6SCPP190 translucent 6 and 8 Qt seal cover is built of a sturdy polycarbonate plastic. It will make a leak proof seal on 6 and 8 Qt containers, and because it is clear plastic, it saves me time as I can see what it stored in it. No more opening multiple containers looking for what I want. Great for use with hot or cold food. I love how well these seal and how hefty they feel. They click into place well too, so you aren't left wondering if they will stay on. If you have a Cambro 6 or 8 quart food storage container, this cover is a must. The fit is very good. For the price you might as well get a few to have some spares. This like the Winter Rose colored camber food storage container lid is exceptional. I use this lid for the white or translucent color storage containers. This way I can see what is in the container from the top instead of uncovering the lid. These are very good quality lids. They do a good job. I would recommend this lid to anyone who purchases the containers. Thank you Webstaurant for offering such good quality products. The Seal covers are MUCH better than the traditional colored ones... They seal tight and wont leak if spilled. They also allow you to complete fill the cambro with product because they are level with the top, rather than sitting inside like the traditional covers. I think these covers are far superior! These are sturdy lids. They seal well, although they aren't 100% water proof like a jar lid. The translucent is nice especially for home applications. I like a few things about this lid. First of all, it's flexible and tight-fitting. It does a great job of keeping product in and air out of the container. The surface is smooth - great for writing or adhering a control label. It's inexpensive enough to get one for each of your 6 or 8 Qt containers. It's also available in other sizes as well from Webstaurant. Cambros are excellent products. Lids are sturdy, hold up well in the dishwasher, don't warp and hold tightly for years. They take masking tap or stickers labels well also. This seal is great. It stayed put and definitely help keep the products fresh. I would recommend this lid to anyone who purchases the containers. I am very pleased with these Cambro containers. The lids are sturdy and easy to snap into place (I push down on each corner to ensure a proper seal) and also easy to remove. This seal is great! I love the shape that causes the lid to find it's place easily on the container. It is rather rigid, more-so than I expected. However, it creates an airtight seal and my ingredients stay very fresh. I also really like the translucent color! This lid seems to be very durable and snaps on to the matching container with ease, it provides an excellent seal and does not easily pop off by accident like some others. Not much to say about these lids. They are made of good plastic and fit nicely. They also fit inside the cambro when not in use for easy storage. Great cover to have in stock. Durable material and easy to clean. Resistant to cold temparatures. Seals in product perfectly. No spills or odors come out. Would recommend to anyone.